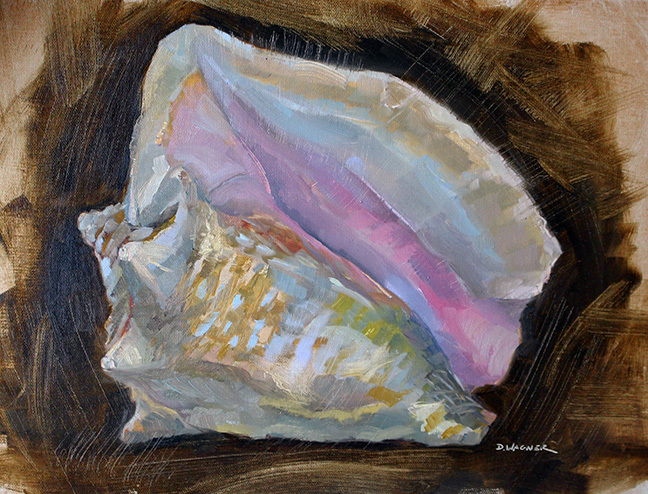 Today’s piece is a small alla prima painting of a very large shell. This is a conch from Bermuda (not collected by me). The painting doesn’t really do the shell justice – it’s beautiful with multiple color shifts and beautiful textures from smooth to jagged and rough. I might have to give this another go! This painting is a 9×12 oil on panel. This entry was posted in Uncategorized and tagged bermuda, collection, conch, cream, nature, ocean, pink, seashell. Bookmark the permalink. Thank-you aprilrainsfineart! I am thinking of working the edges, where the shell meets the background with more subtlety – some sharper, some disappearing. I would also like to try some different background colors. Thanks so much for following me and for your comment. Even better XD I would love to see that if you decide to go through with it!